what drives the survival spirit, when running a music festival by 1 person, or a magazine by 2? The event starts with the sharings from Taichung residents Ron and Mark Hanson, the New Zealander brothers of White Fungus; also musician Jin Sangtae from Seoul, South Korea who runs dotolim (anchor rising). They share how and why they continue to organise experimental music / arts performances, and publications and other events when there is no core funding support for the organisations. White Fungus started in 2004, as a photocopied magazine, to currently a magazine that is distributed throughout the globe; they also extend their passion to showcasing experiential live performances. Ron writes and Mark designs, they raised White Fungus with both of their other full time jobs. In 2016 they presented a performance and magazine launch at the Wall, Taipei, which sold more than 400 tickets with a full house audience. Jin Sangtae as an experimental musician from South Korea, inspired by Otomo Yoshihide he also started to host improvised concert at his small office at night from 2008, called dotolim (anchor rising). After 5 years of small concert series and publishing every performance as audio-visual archive online, he hosted festival Dotolimpic. Ran without art council funding, he combined resources from all around and hosted two years of 3-day festival with musicians from all around the world. Besides each sharing their organisations, we will also discuss their missions, drives, and experiences in running their organisations. After full-time work and life, what drives them to maintain the organisation, and both with such growth and flourish. They will also bring their own magazines, zines, and music publications for display and sales. This event will be in both English and Mandarin. 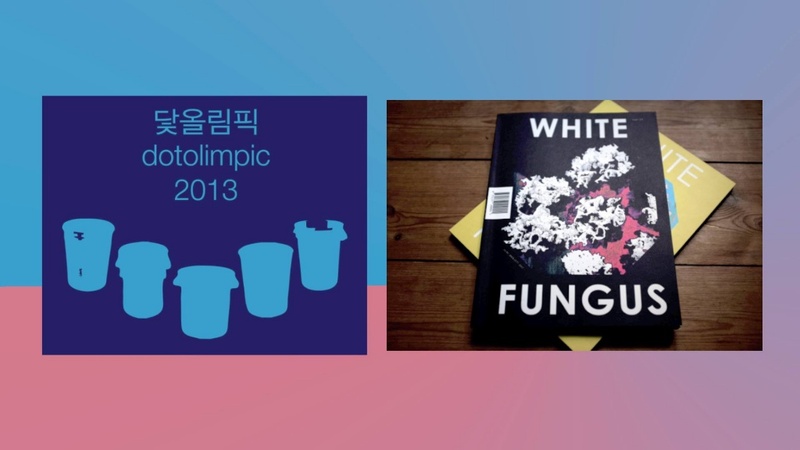 White Fungus is an art magazine based in Taichung City, Taiwan. Featuring art, music, comics, history and politics, the magazine is distributed globally by WhiteCirc in London. White Fungus covers art from all over the world and places Taiwanese artists in an international context while introducing Taiwanese culture to new audiences. Past issues have featured Taiwanese artists including Yao Jui-chung, Chen Chieh-jen, Hong-Kai Wang, Lin Chi-wei, Wang Fujui, and Betty Apple. White Fungus has been featured in Vice, Complex, Monocle Radio and Wire Magazine. In 2012, White Fungus was included in the exhibition Millennium Magazines at the Museum of Modern Art in New York. The exhibition was a survey of magazines made by contemporary artists since 2000.
dotolim is the name of a small business occupying a small office space, established in 2006 in Seoul by Jin Sangtae. In November 2006, Jin visited GRID605, a similarly small office space that also served as a performance venue for musician Otomo Yoshihide. Inspired by Otomo’s example of utilizing a business space as a performance venue, Jin followed suit with dotolim in 2008. dotolim is a very small space, with a capacity for only 30 people; this creates an intimate connection between performers and audience members. Jin Sangtae has presented concerts at dotolim nearly every month since then, about 100 concerts to date. The ‘dotolim concert series’ seeks to connect improvised music to all of the arts, and to new audiences. festival ‘dotolimpic’: since its opening in February 2008, ‘dotolim concert series’, venue for improvised music could host several events. And depending on audience’s donation, door money, social funding, personal donation and partners’ support, festival of improvised/experimental music ‘Dotolimpic’ was successfully held in October 2012 and 2013 without funding from art council.